New this Spring from REV'IT! are the REV'IT! Palmer Gloves. These new vintage-looking short cuff gloves are the perfect summer glove for the rider who is looking for style without having to sacrifice protection. 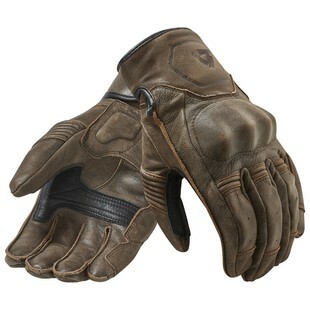 These rugged and stylish gloves merge the best of performance, comfort, and style. The retro look comes from the rusted cowhide shell which offers that vintage vibe that is tough but also supple. In the safety department, the Palmer Gloves are packing visco-elastic knuckle guards, PWR|shield knit and Temperfoam in the palms, and are sewn together with their incredibly strong PWR|shield yarn. Whether you're scrambl'n, cruis'n or cafe race'n the REV'IT! Palmer Gloves have loads of style and functional protection for the classically minded enthusiast.